I believe that this work was executed during the time she studied under Emil Carlson at the San Francisco Art Students League. From Askart: Anne Bremer (1868-1923) was a California painter, influenced by Post-Impressionism, who was called “the most ‘advanced’ artist in San Francisco” in 1912 after art studies in New York and Paris. She was described in 1916 as “one of the strong figures among the young moderns” and later as “a crusader for the modern movement.” She had numerous solo exhibitions, including one at Arlington Galleries in New York in 1917. After developing leukemia in about 1921, she gave up painting and wrote poetry. Following her death in 1923, Albert Bender established several memorials, including an award for art students and the Anne Bremer Memorial Library at the San Francisco Art Institute, a marble chair in the Greek Theatre at the University of California, Berkeley, and an outdoor sculpture at Mills College. He also sponsored publication of a pair of limited edition books, The Unspoken and Other Poems and Tributes to Anne Bremer (Printed by John Henry Nash, 1927). Through Anne Bremer’s influence and contacts with artists, Albert Bender was inspired to become an important patron of artists and art museums and a founder of the San Francisco Museum of Modern Art and Mills College Art Museum. Anne Milly Bremer was born in San Francisco on May 21, 1868, to upper-middle-class German-Jewish immigrants Joseph and Minna Bremer. In 1880-81 she traveled in Europe with her parents, and they brought back a cousin, Albert Bender, from Dublin, Ireland, to live with them and work for another uncle, William Bremer. 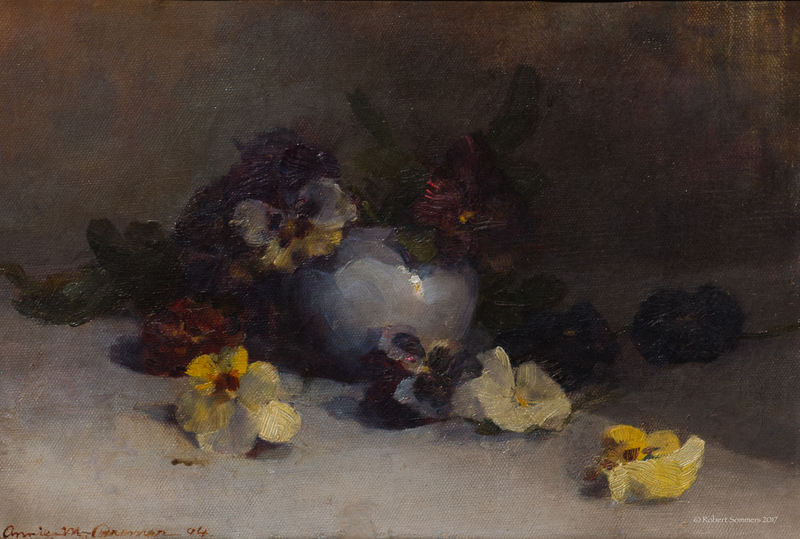 She studied art with Emil Carlsen at the San Francisco Art Students League and with Arthur Mathews and others at the California School of Design, Mark Hopkins Institute of Art, receiving a Certificate of Proficiency in 1898. By the time she graduated she was on the Board of the Sketch Club, an organization of San Francisco women artists, and she was its president at the time of the 1906 San Francisco Earthquake.Under her leadership the Sketch Club produced the first major art exhibition in the city after the disaster and enlarged its membership to include men. In 1916 she was elected secretary of the San Francisco Art Association, where she helped lead a major phase of growth in conjunction with the creation of an art museum at the Palace of Fine Arts.